I started stitching this UFO project that was my Mom's. It is called Expect The Unexpected by Karen Sievert of The Nifty Needle. Mom has everything cut out and many of the units sewn together. Seems she lost interest... I'm not one to leave a project collecting dust, so it came back with me to finish. There are a total of five blocks across and six blocks down. The block size is 15" x 15". 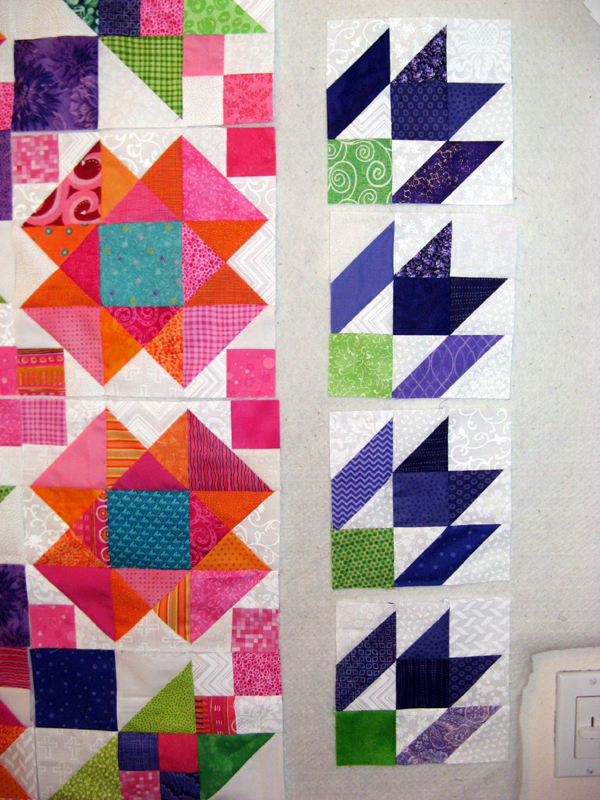 Two borders surround the blocks; so it will be a large quilt. 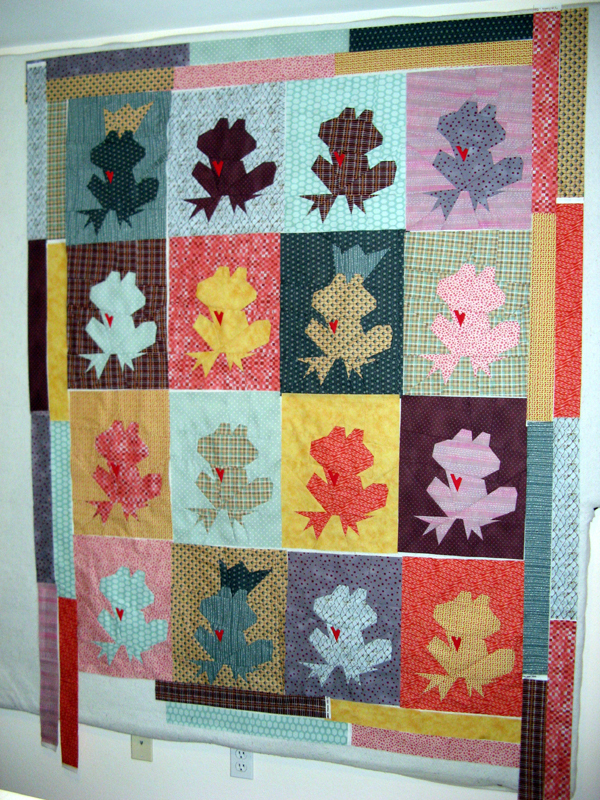 These are the four quilts Kerry finished the quilting on that I got from her on Sunday. I need to prepare each of their bindings, sleeves, and labels still. All of these were 2015 UFOs off my list. 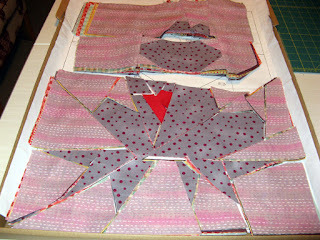 The back needs to be pieced on Kristoff yet before it moves to the quilting queue at Kerry's. Last but not least is Katchaklaus. 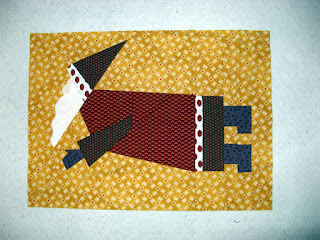 All the applique of the faces is done on section B2; ready to move on to stitching more flying santas. What a fun day Kerry and I had at our own Believe! workshop. Lots of preparation for these blocks. First cutting the beards and then the faces. 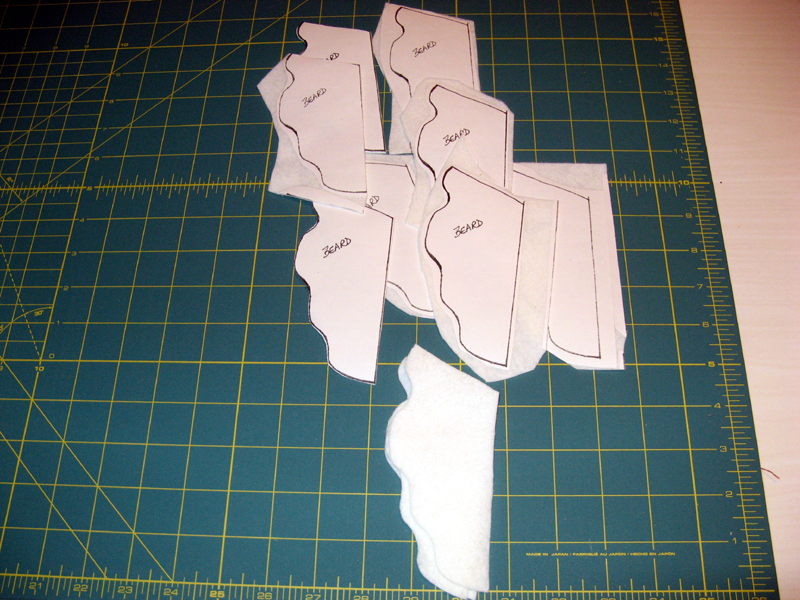 Faces appliqued in place then beard overlapping. B2 piece was the start of this block. The goal of the day was to get to one finished block...and we did it! Here's mine. There is either a sign that says "Believe" or a star that will hang from the tip of Klaus's mitten. That will come as the finishing touches are applied. Katchaklaus is well on it's way! This is the next one to stitch. I am planning to get to this one tonight. 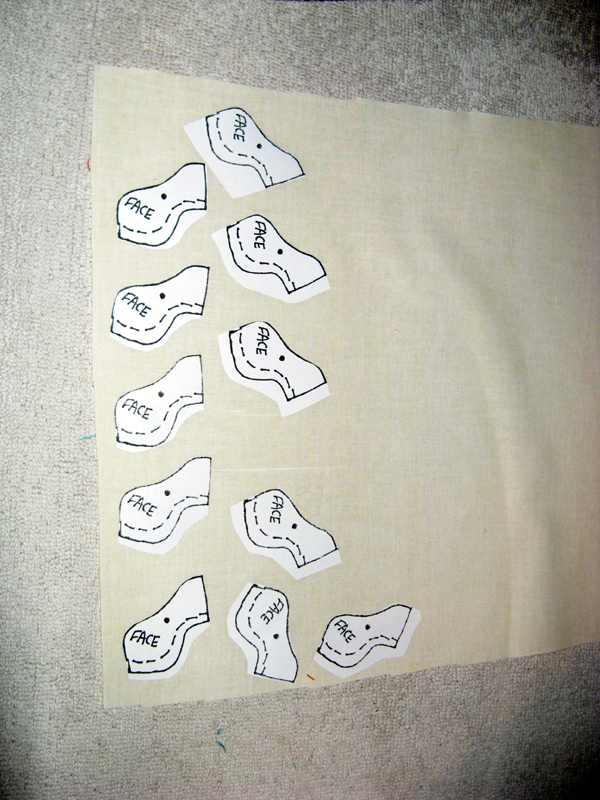 The rest of Sunday sewing was appliqueing the faces on section B2. 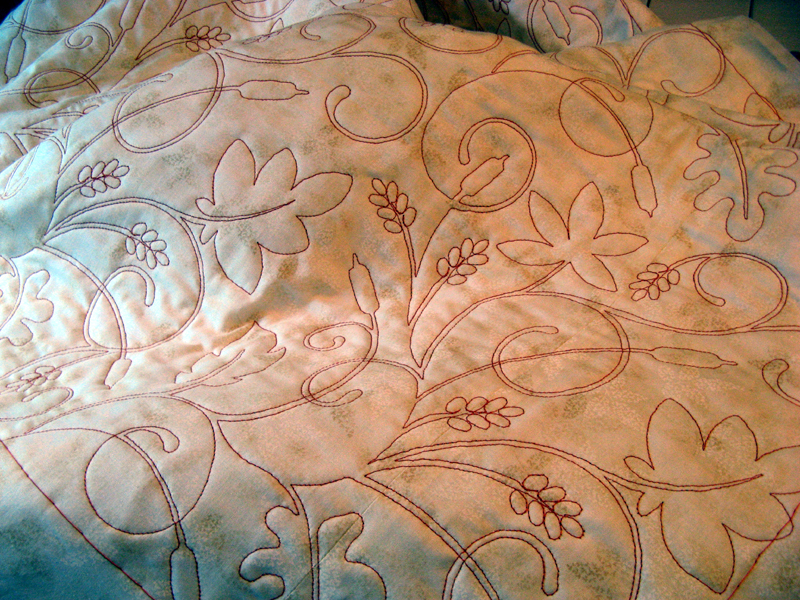 Kerry brought me four quilts today. 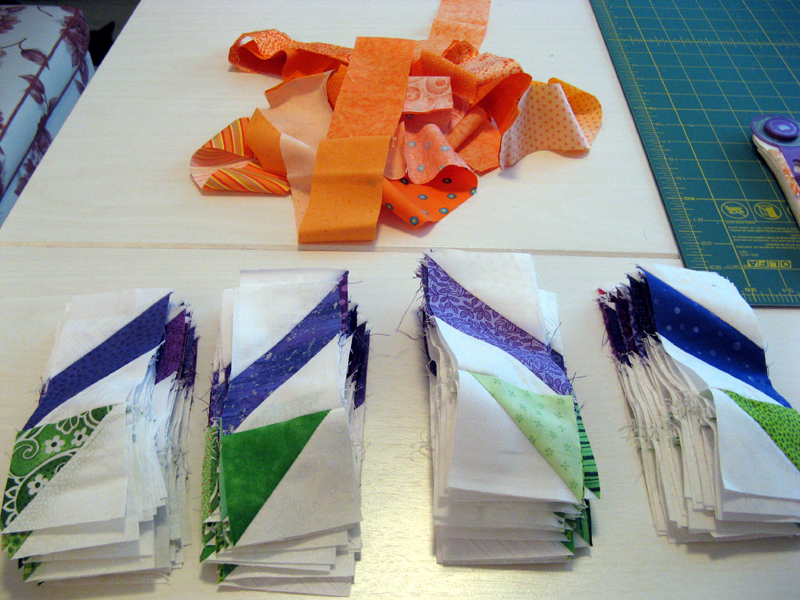 I'm excited to have lots of binding in the coming days. Kidd, Krossways, Koronado, and Kristmas Keepsakes are going to make an appearance on Wednesday...come back and check them out then. Hope you get to all your sewing desires. Check out more projects today through Judy's Patchwork Times. I have Kristoff finished this week. Theses frogs are just so cute. 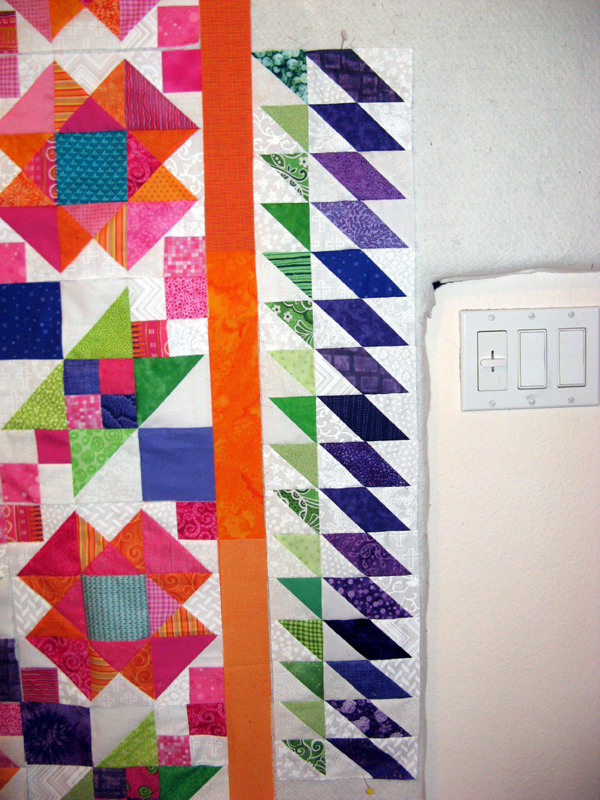 My blocks finished a little taller than the pattern called for, but I didn't want to take too much off the top or the bottom. Doing so would have brought me way to close from the top of the crown or the lowest toe. 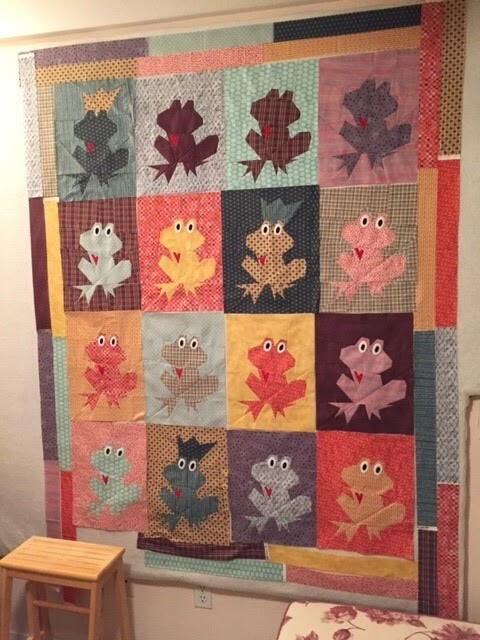 I also made it less blocks than the pattern called for. 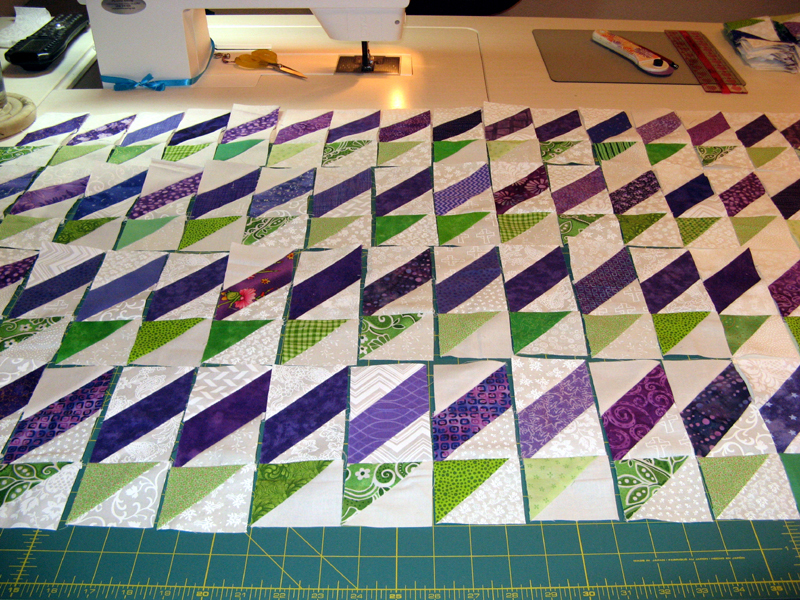 I thought 16 blocks finishing at 52.5 x 71 was plenty enough in size. Today I'll be starting a new Buggy Barn design called Believe! The workshop was cancelled so Kerry and I will have our own at my home. There will be more on this project tomorrow. So come back for a glimpse on Design Wall Monday to check out how far we get. I finished sewing the eyes on all the frogs. (The photo was taken before I finished the top row.) Next will be the smile. I'll be using six strands of DMC pearl cotton thread to give them some bulk. 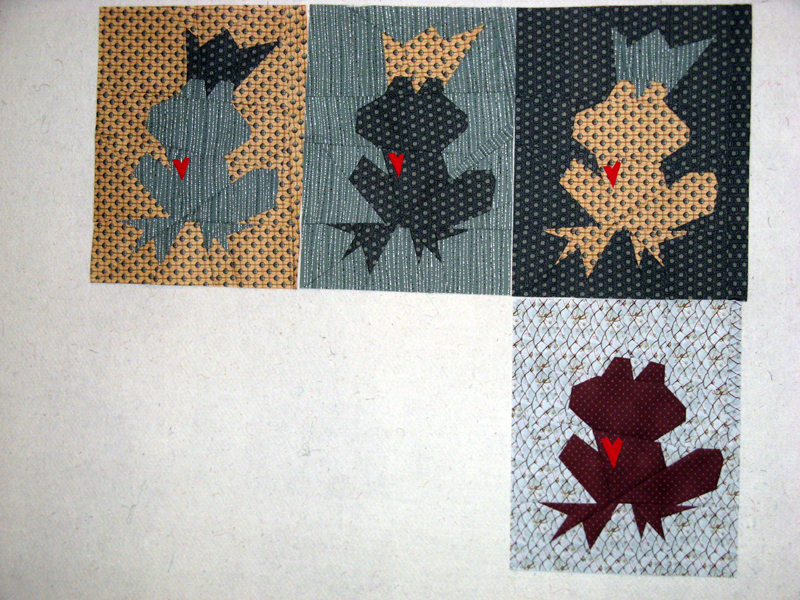 Wondering if I should change the plan from black to white on the darker frogs... There are at least four that I'm worried about not showing up well. The Believe! workshop scheduled this weekend has been cancelled. There were only two that signed up; lack of participation caused the cancel :(. Kerry and I will have our own workshop same time at my home instead. 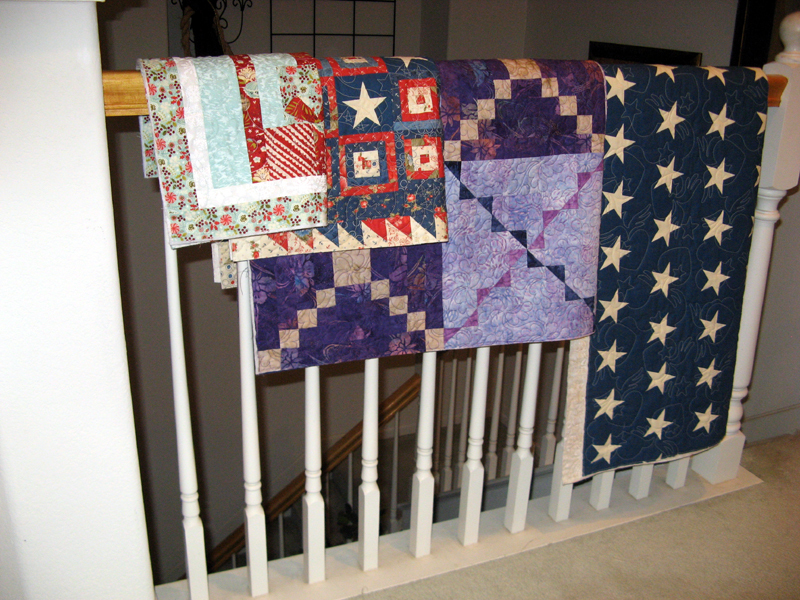 Kerry hasn't sewn a Buggy Barn, but with my experience of making them it shouldn't be too difficult getting her going. Flying Santas to show soon! Here is a sample of what Kristoff frogs will look like once the eyes are stitched down. 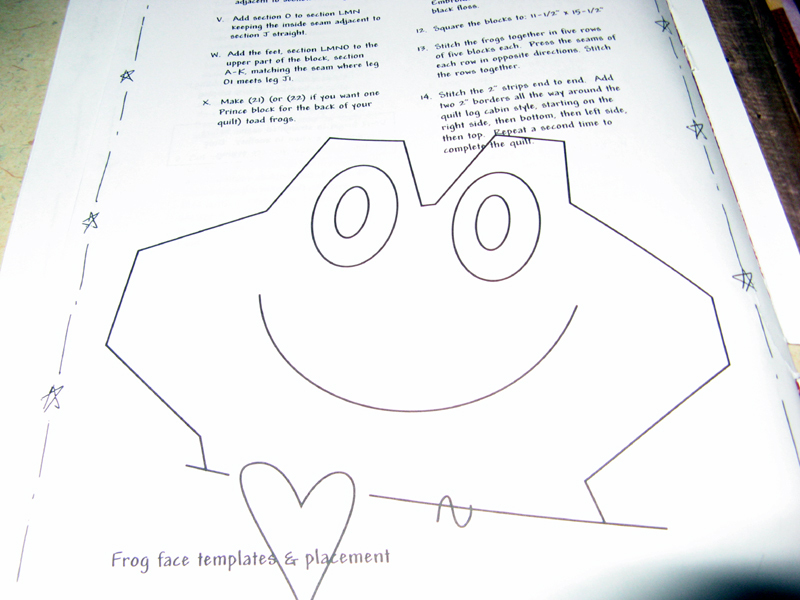 I have prep'd all the eyes and pupil parts for all the frogs. I will be blanket stitching them in place over the next week. Next will be the smile which will further define these guys. The one with the eyes sure stands out! 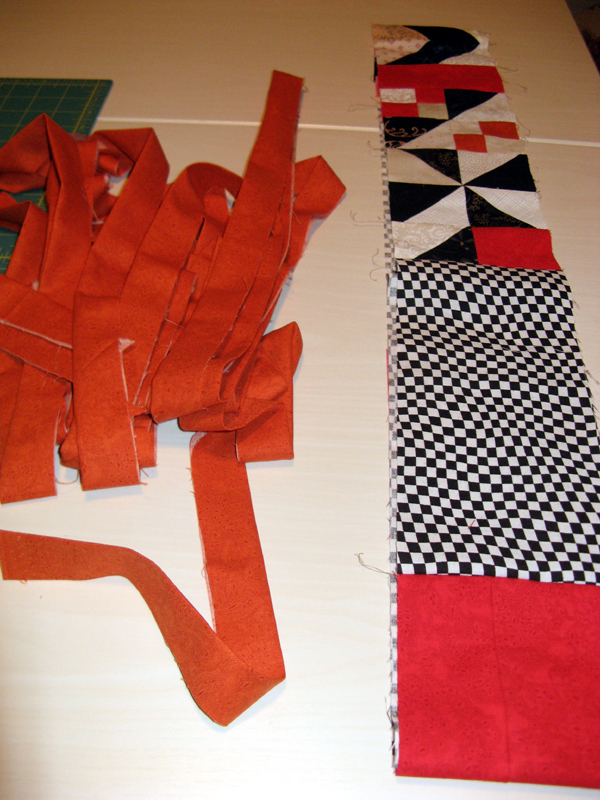 I've cut the strips that will become the binding for Komatose. 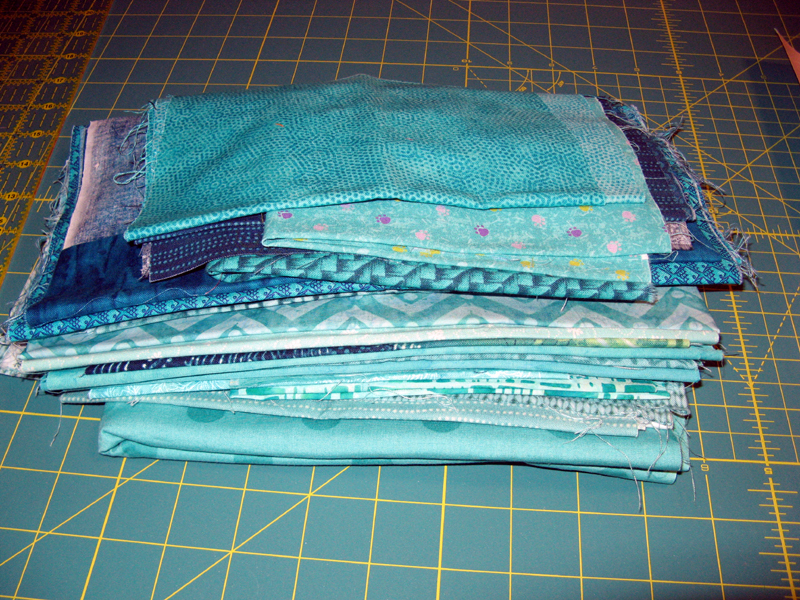 I think there is enough cut, but need to sew these together before I know for sure. The stitching will be after the last ~20" are sewn of Kamikaze's binding. I just could stay up any longer or my morning get up time would be in jeopardy! I hope Patchwork Times has a link up for today. 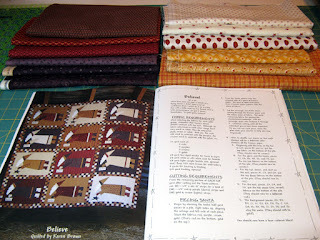 I never did see the link up for Sunday Stash Report... Others are working on great quilting projects. Check them out! 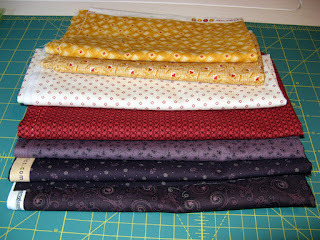 I purchased 3.5 yards of fabric from Rosie's in La Mesa on Tuesday. I had thought I only needed one cream an two purples...found something better. I am all set for my Believe! class that is later this month. 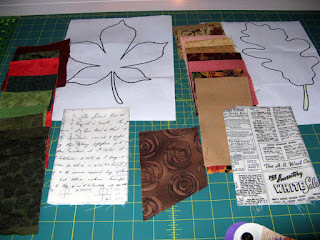 This project has an awesome name thanks to Nancy J who is one of my followers. Katchaklaus! 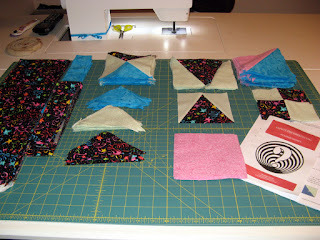 I focused time on Kamikaze preparing for the binding and sleeve. I will be trimming it down tomorrow morning so I'll have something to work on during the day's football games. 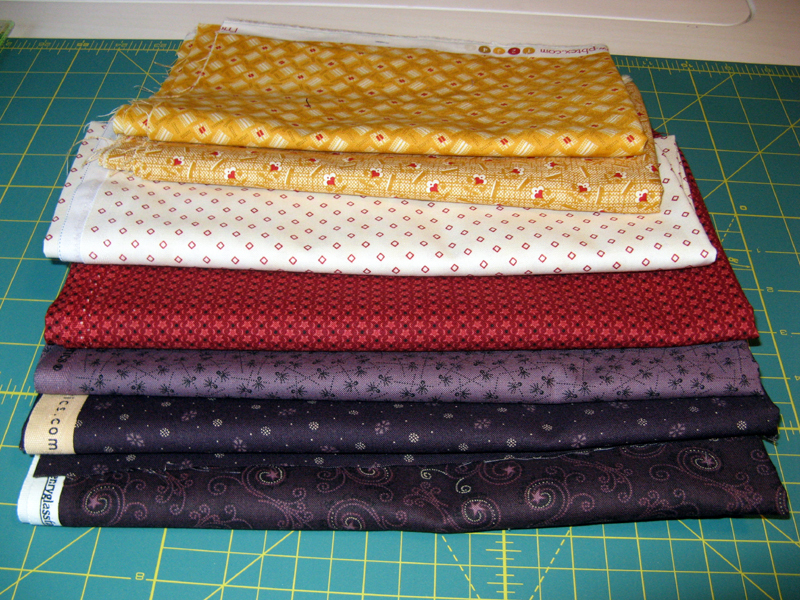 These are the fabrics for the binding of Komatose. I finished the project last weekend, but binding hadn't yet been prepared. I'll be using strips from all the teals used in the project. Kristoff blocks are finished. 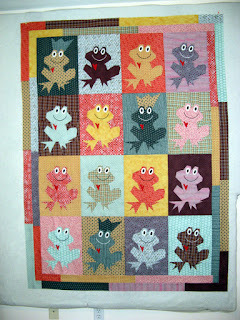 I have to figure out which frog block finished the smallest and cut all the others to that size. If it is too much smaller I might be adding a strip of the background to it then re-estimating what my average block size is. All blocks must be the same size. 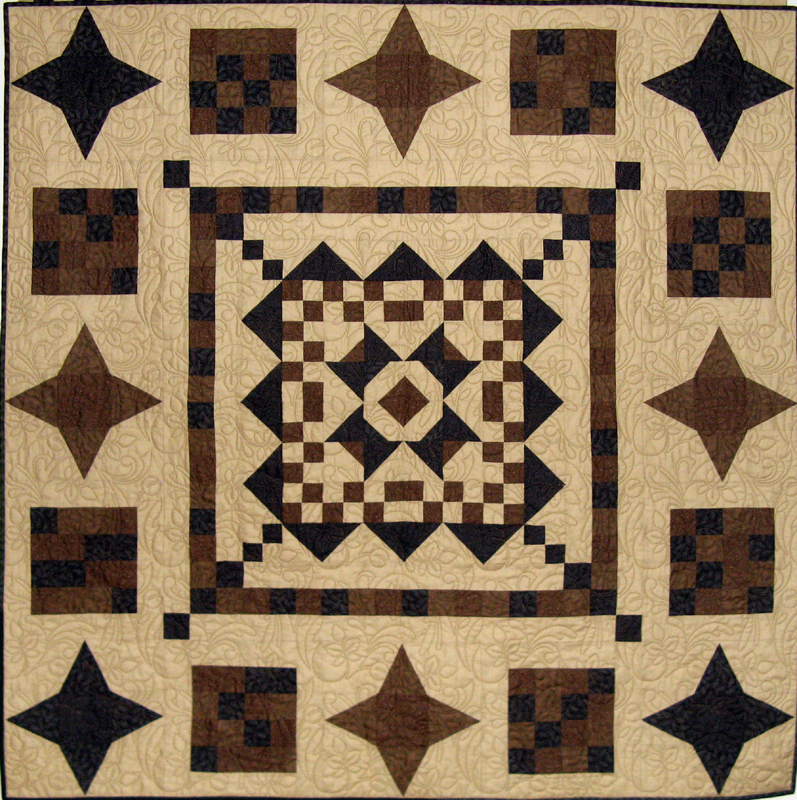 The border is 2-1/2" strips sewn in a log cabin style. 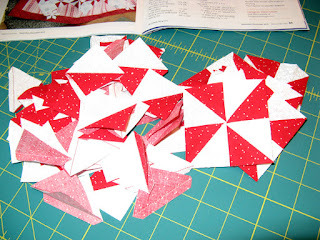 My initial thoughts are to use the solid red I used in the hearts for the binding. I will see how that works out as time moves forward. After the block size is decided I will be working on the eyes, pupils, and smile. 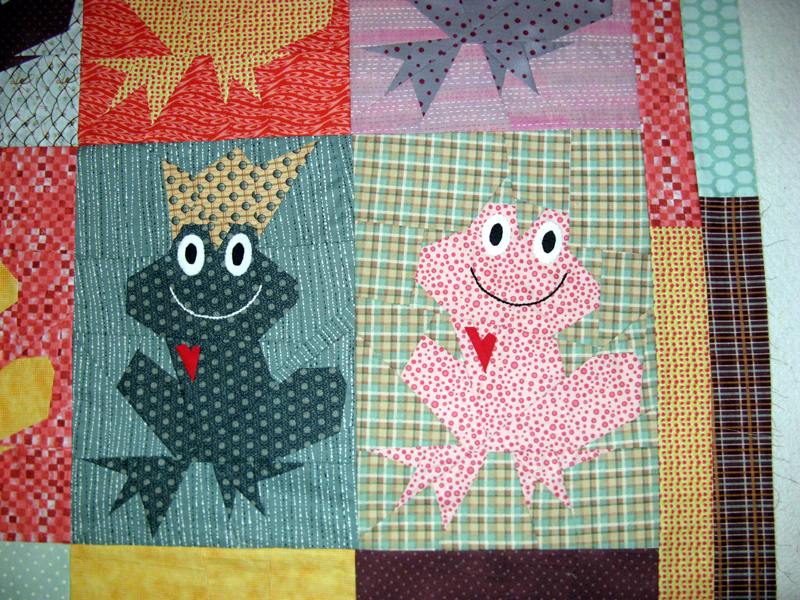 These frogs have lots of personality. How do you like the placement of the prince frogs? I am planning for the back to be all the leftover fabrics. This one should take a bunch from my stash. Numbers for this week have a little enhancement for Katchaklaus that will soon be changed to a used. I hope you have a wonderful week. 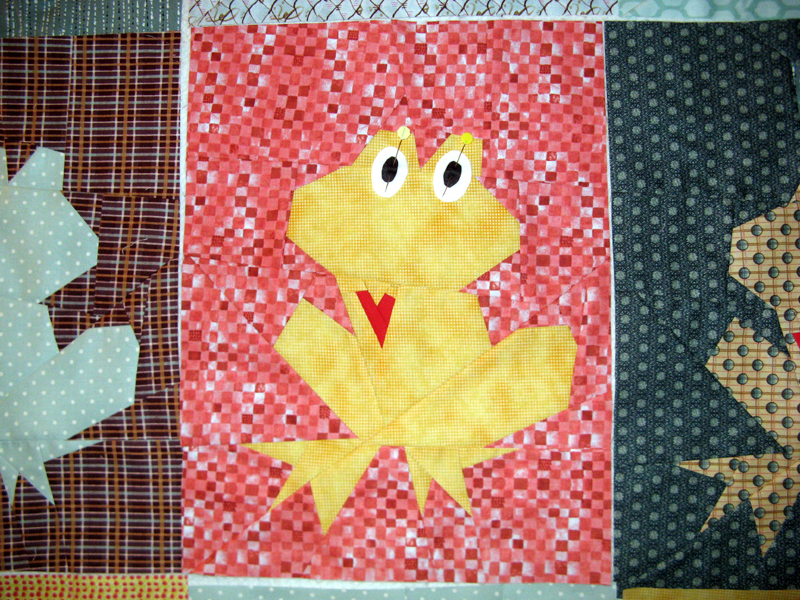 A fun filled Buggy Barn workshop is right around the corner on Sunday, October 25. I'm very excited about this workshop project. Believe! is the project led once again by Julanne Burgstrom. I stopped in at Rosie's in La Mesa before my Sunshine Guild Meeting on Tuesday to look for and hopefully pick up the remaining fabrics. 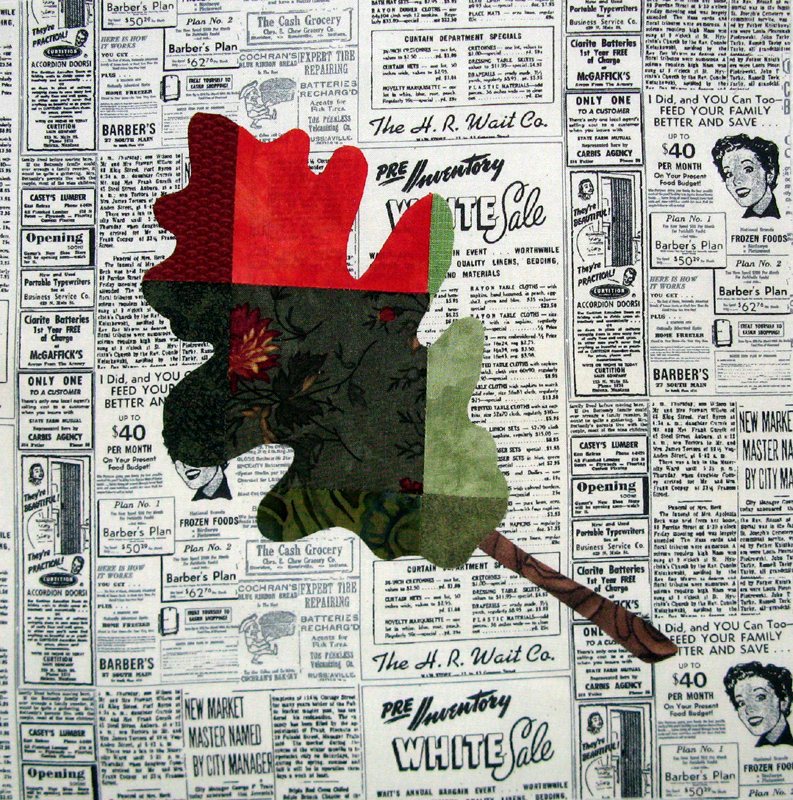 Well I found seven 1/2 yards that I was happy with so a purchase was made! The bottom white you see in the photograph above has been sitting in my stash for several YEARS! 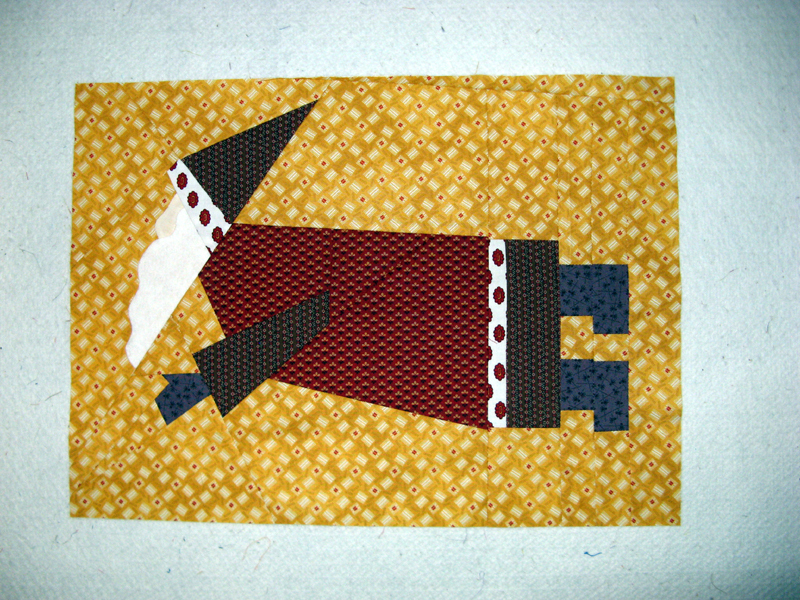 It finally has found a home with flying Santas...who would have imagined that? This project is yet to be named so a little help would be great. 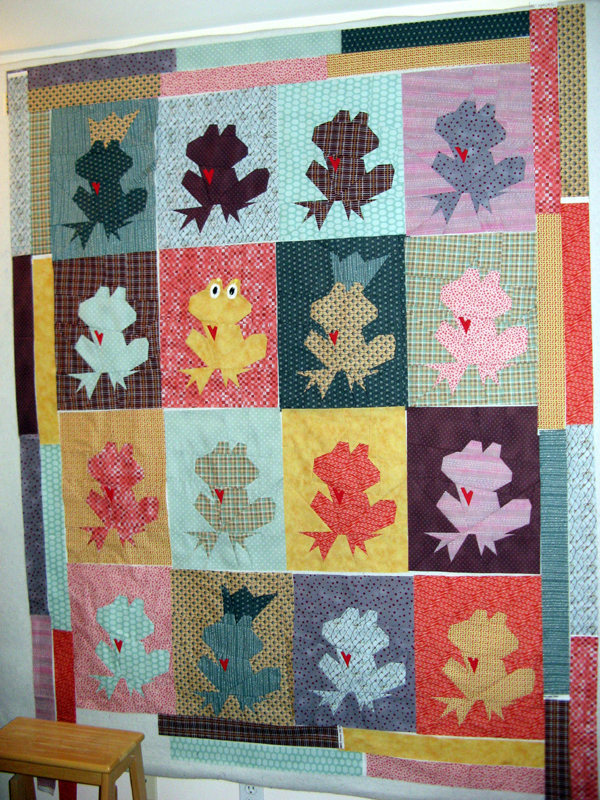 I have lots of "K" quilt projects that are Christmas inspired so this one becomes difficult...whose clever? Tomorrow is Buggy Barn Club Monthly Get-Together. I'm thinking about packing up my Kristoff (Prince Charming) in my Pizza Box and heading over after work for three hours of sewing with like minded Buggy Barn gals. 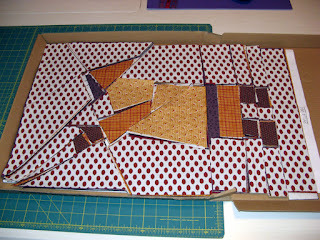 I have some units to stitch tonight that will make that moving of pieces easier...we'll see how much I can get through before bedtime. Tuesday also brought Kamikaze home with me. I will probably get to trimming it down and putting the binding on this weekend. We have a couple of good Netflix coming our way and of course Sunday football games where binding works well into the schedule. Look at the back! The orange thread on the cream back Oh My Gosh! 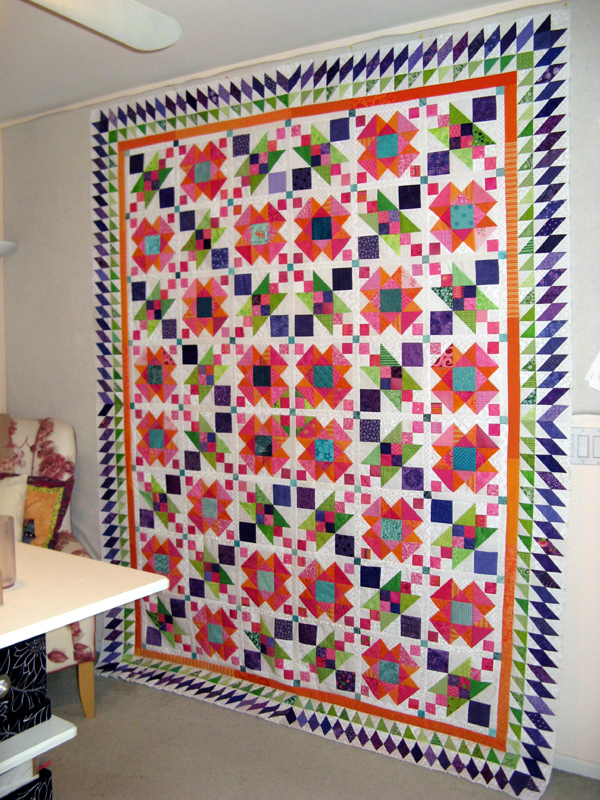 I only have one more block assembled as Sunday bedtime rolled around. Unlike some of you I have work tomorrow. I found myself changing the fabric arrangement of the remaining blocks. The fabrics in this project are really different, but that will be the charm of it when finished. I have the ear and head section done on all of the blocks. The heart section that will always be red is the next to stitch. All of the remaining frogs will not have crowns. 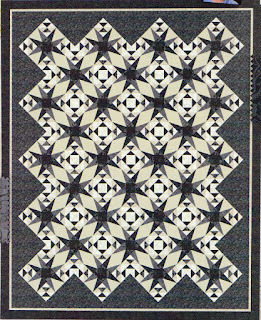 In case you are interested the pattern can be found in the Undeniably Crazy book by Buggy Barn. It is called Prince Charming. I will be back to stitching frogs later tonight. 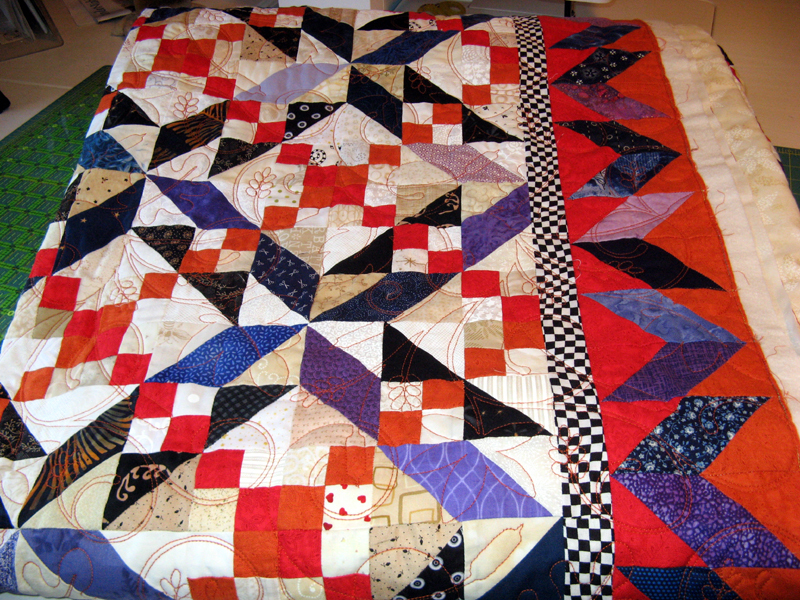 Find time to see more projects through the links at Patchwork Times. Enjoy your week. Today I've been finishing up projects that need to be ready on Tuesday. 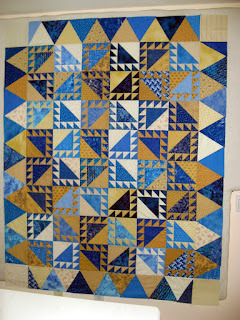 First is to get the BOM for Sunshine Quilt Guild done. I took two to stitch. I love the background that was provided. Very different choice for the fall inspired leaves. 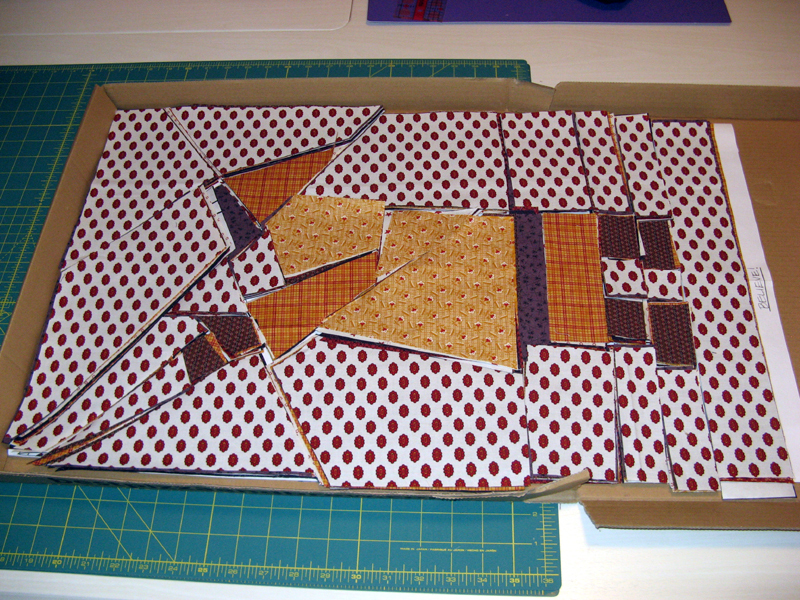 Sewing the back and cutting batting for Komatose was next. 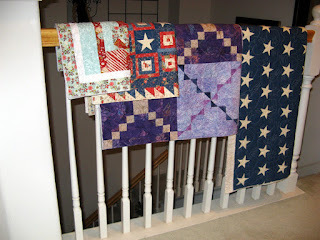 Kerry and I will be swapping quilts on Tuesday too. 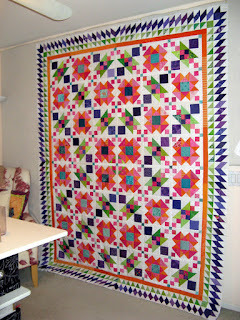 Kamikaze will be coming home with me and Komatose will be added to the quilting queue. Komatose is my finish for this week. As for new projects, Kristoff is back on my sewing table. 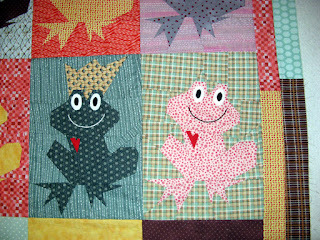 I finished two more frogs with plans to finish a few more today. 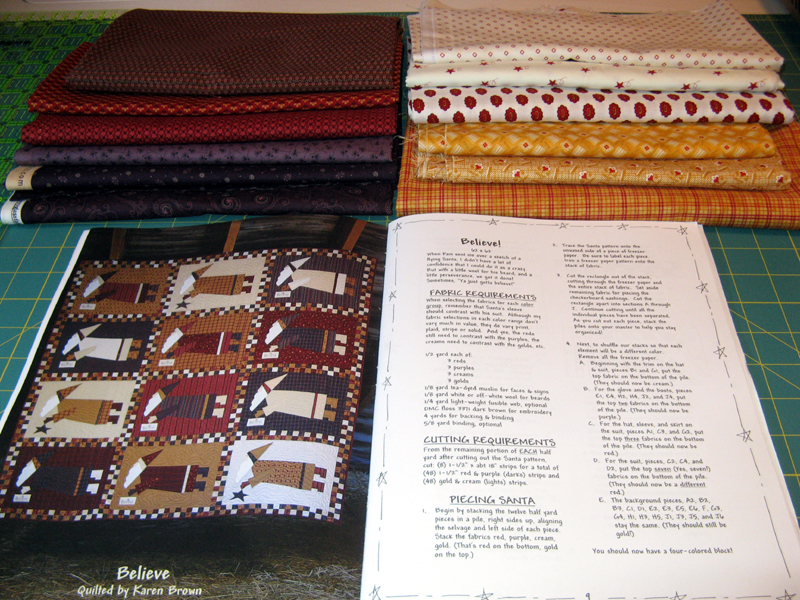 I've mentioned a dozen times before how much enjoyment comes with stitching Buggy Barn designs. 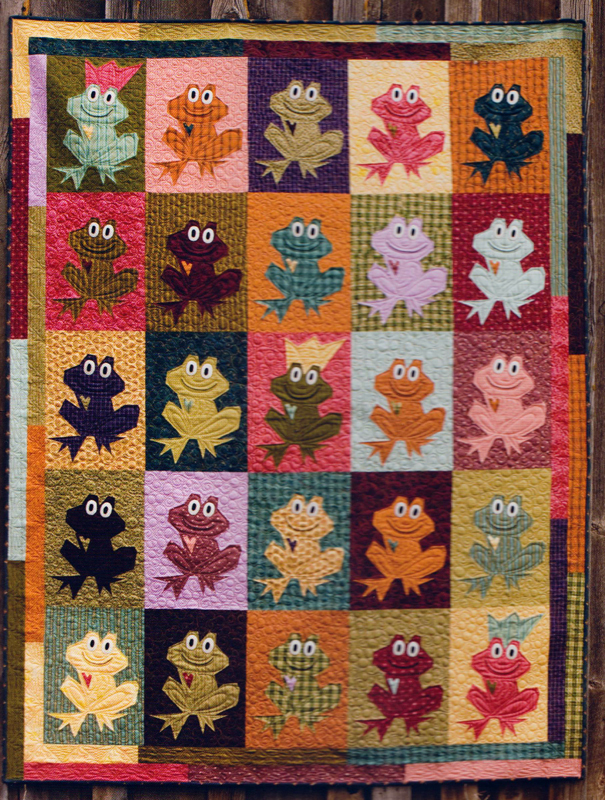 There are a bunch more frogs to stitch. You will be seeing lots of "hopping" in the coming days. 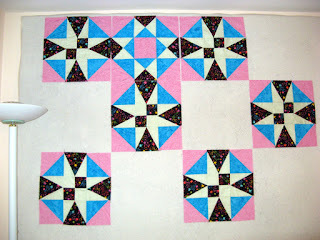 This is a new pattern that I sent my 49 cent SASE off to yesterday. 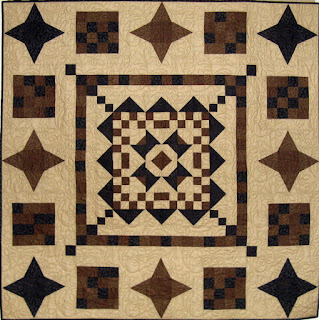 Have you seen it on the back of the December 2015 Issue 137 of American Patchwork & Quilting? The information to get one for yourself is on there. 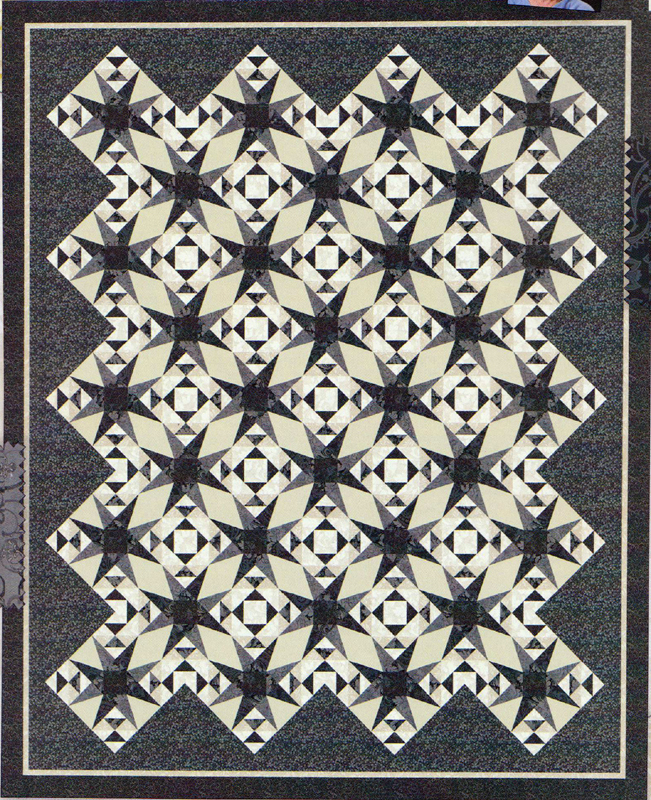 It is by Jackie Robinson of Animas Quilts introducing the Basic Black& Beiges fabric collection by Benartex. AWESOME! In the meantime I'll be getting back to the project from the workshop I attended recently. Anxious to stitch a few frogs again from the design by Buggy Barn. Hope your Friday was a good one. Enjoy your weekend. I finished binding this one on Sunday during the football games. We had a delightfully rainy day in San Diego. How perfect is that match for a few hours of binding? 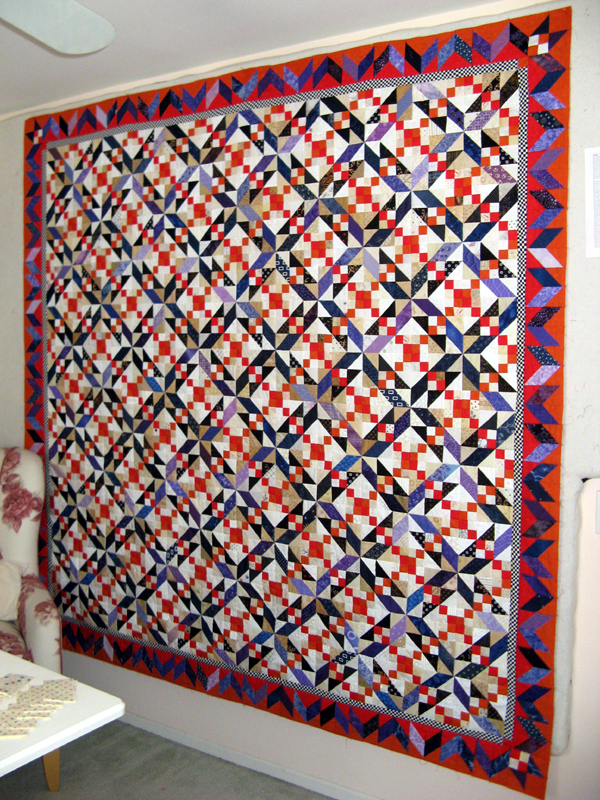 The quilt was started at Road to California 2015 during the evening mystery. The mystery workshop was with Tiffany Hayes, her design called Downton Abbey. Tiffany is the creator of the Goddess Tool. You may wonder about the name I have given my project...it was inspired by a blog follower of mine. The Carnarvon family seems to be linked to the Earl of Grantham. Of course I took liberty with the "C". This past Monday was my birthday. 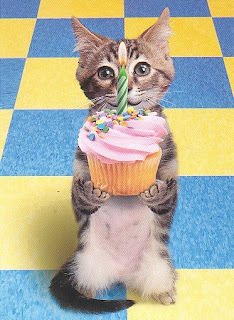 My Mom sent me a birthday cake...how cute is this little kitty? Today is my sister's birthday. She has always been a birthday wish come true as two brothers were born ahead of her. I finally had a sister! Quite a wonderful gift for a nine year old me. Happy Birthday Karen! Krystal Kreek is my UFO for October, #8. It has been done now for a little while. 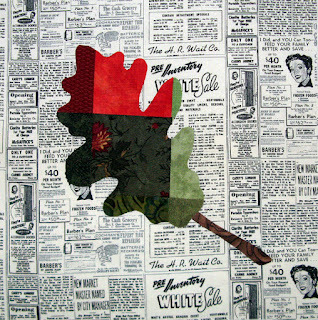 It is a design by Bonnie Hunter called Lady of Lake Erie. Quiltmaker Magazine brought it to us in the May/June 2011 issue. I had hoped to use the bonus triangles from Kamikaze, but doing so would not have worked unless I wanted a completely scrappy block. Not a problem though because everything was available in my stash...ahh good! I'm still working on Komatose. 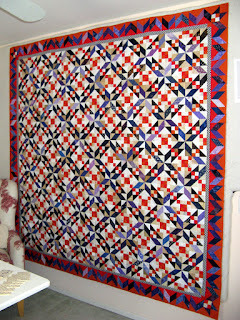 What is left is the pieced border, sashing, and final assembly. The first photo are all the Unit 1s ready to be stitched. The second is one half of the top border. It will be joined with the same number of Unit 2s. Komatose is my #3 UFO project. Have a wonderful week! 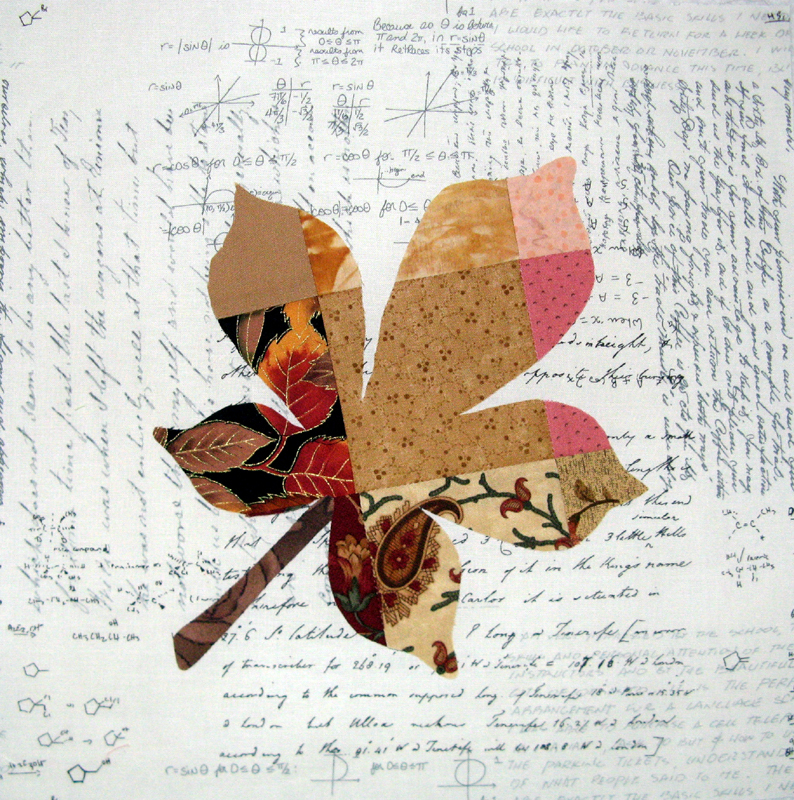 See more work through the links at Patchwork Times. This weekend I have been able to finish most of the piecing. Above are the four corner stones. 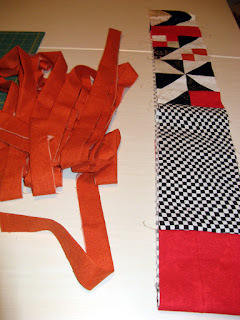 Next is the orange strip that will be used for the inner border. All the outside border units are done too. 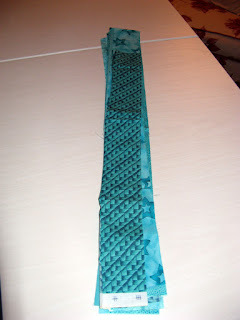 I have the sashing yet to go, but it is cut out. A couple nights more should see this project into a top. 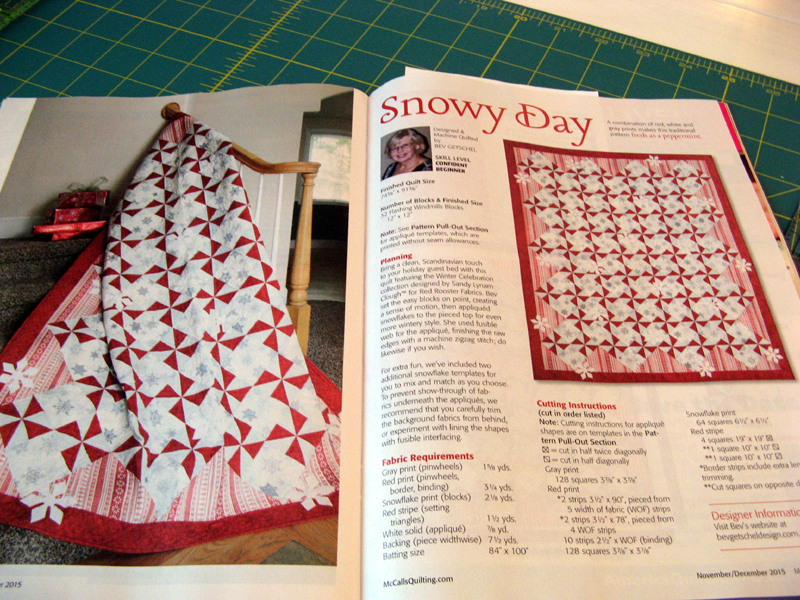 I got the November/December McCall's Quilting magazine this past week. 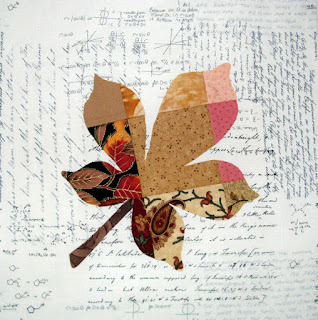 Snowy Day is perfect to use up a bunch of pinwheels that were once thought of for a round robin. 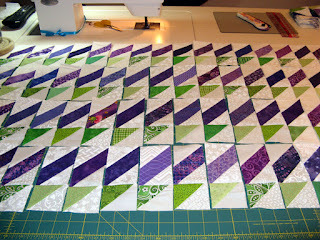 The blocks will finish half size of the pattern, but I'm excited about that. I sure don't need another large project. No changes to stash this week. I am looking forward to a little reduction with Komatose next week. Enjoy your week ahead!